MUCH MORE TO BE INFORMED ABOUT, READ FURTHER! A member running in the Bargaining Committee elections should be knowledgeable of the language in our current CA, be fully committed to learning, and genuinely interested in the active process of winning a better contract language for the whole Unit 1 membership. For full bargaining committee description and responsibilities check out article 12 of our bylaws. Do not worry, the elected members will be trained! Workshops are a mandatory part of being on the Bargaining Committee. The Bargaining Committee meets at least once a month prior to actual negotiations with the employer that by labour law can begin 90 days before the CA expiry. Then the BC meets as situation demands as a committee and with the employer to negotiate, which can be several times a month. The BC is responsible for reporting to and takes directions from, the Executive Committee and the general membership. A member can nominate a fellow co-worker to run for the BC at the November 26th elections. You can also nominate yourself, right there, so called from the floor. If a member cannot attend the elections due to schedule or other conflicts, a written statement, presenting the intentions to run and willingness to stand for the position, is necessary to be forwarded to the union (either directly by email or presented by the member who nominated at the GMM). When the nominated person is present , the member is required to state a short, two minute statement of intention to run. There are two other committees directly related to bargaining that are created about the same time the BC members are elected. Bargaining Research Committee NEW– sustains of four members who are appointed by the Executive Committee. Honorarium is received monthly. BRC members will be appointed by the EC by the end of December and will begin working with the BC by January 1, 2019. Please let the local know by emailing info@cupe4207.org if you want to serve as a Bargaining Research Committee member. The task is to gather information, and process and analyze data that are beneficial to the Bargaining Committee’s work to help craft and support an argument in order to secure better contractual language. 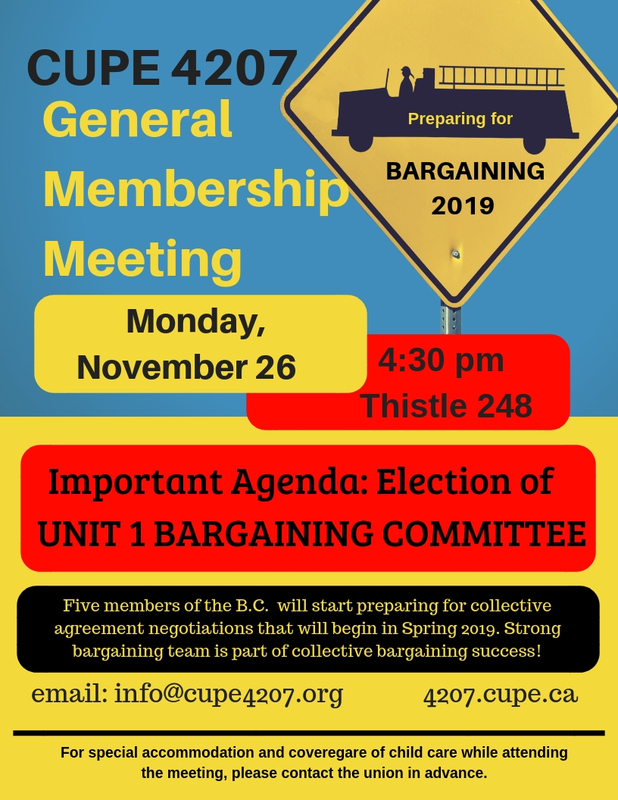 Bargaining Support Committee, an ad hoc committee of activist members who act as a mobilization force and liaison between the BC and membership, is composed of interested members once the BC members are elected. No honorarium attached.